Signalator offers a number of delivery options including automated execution of trades (free for MT4 / MT5 metatrader accounts), Email alerts, SMS, website personal page alerts . All alerts are sent instantly and simultaneously by Signalator website via all chosen delivery options. There is no time gap or delays for any of the mentioned delivery option. All options are included free with any paid subscription (demo, monthly, guaranteed pips, managed accounts). Forex signals alerts include exact entry and exit prices (open and close), 1 stop loss level and 1 take profit level (no hidden, temporary or intermediate levels), date of an alert and traders comments (if any). All signals are market orders - you have to execute a signal once you receive an alert. Do not wait for an opening or a closing price to be reached (execute it as it is by market prices). The most popular and the most required delivery option is an automated execution of trades directly on your account. Signalator offers fully automated execution of trades for MT4 / MT5 (metatrader account - free with any paid subscription) and execution of trades by Signalator traders (free with managed accounts). For your convenience, we provide a free VPS server for your trading platforms. Please read here about automated trading in more details. Every registered user is provided with the personal page to view the subscribed trading signals. This option is available with any subscription (including the free signals subscription). On the right hand side of your personal page you will see the full list of active signals with the activated delivery options. Link Title: click the title to view signal alert. The title shows the currency pair used for a signal. Subscription type: the type of the subscription. If you use the periodic subscription (14 days, 1 month, 3 months, 1 year) you will see the "Periodic" subscription type and the expiration period "Valid until". If you are using the guaranteed pips subscription, the "PIPS" image turns green and you see the "Guaranteed pips" subscription type and the amount of pips within the "Pips left" field. Activated Delivery options: depending on the activated delivery options you will see either coloured or grey pictures of the automated trading ( ), the SMS ( ), Email alerts ( ) and the WEB personal page alerts ( ). Email alerts are sent to the corresponding email alerts address. SMS are sent to the phone number stored with the account. If you would like to change / update the delivery options or the delivery information (Email or phone number), please go to the my details page or contact your personal manager. Click the "My Signals" link within the personal menu to view the overall table of your trading signals (please note: this option is not available with the free demo). The following table will be loaded. You will find the Currency Pair, The date & time of the most recent signal, the position of a signal, the take profit and the stop loss levels and the comments. For your convenience all closed trades are displayed with the grey background, all long (buy) are displayed on the light blue background and short trades (sell) are with the light orange background. With just a glimpse of a table you will understand which signals are opened and if opened in which direction a signal is opened. If you click any trading signal to view its detailed alerts page you will see the page with the detailed most recent alert (Open, Update or Close) and the history of alerts for the most recent trade. Please note: the archive of the all alerts is available at Signals History menu within the personal page. The most recent signal shows the type of a signal (The Open signal for new position, The Update signal for updating SL / TP levels and The Close signal for closing of a trade). The signal's date, the price (Open or Close), the TP/SL levels and the comments are displayed. If the position is closed, the trading result is shown. In the bottom of a page you will find the history of the alerts for the most recent trade (alert for a trade open, any updates of a trade and the closing signal). 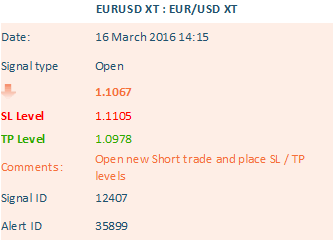 You may check when the trade was opened and which alerts were sent. If you are subscribed to either SMS or Email alerts, the Signalator website will automatically send you a copy of an alert as soon as it is released. You will receive a detailed information similar to a web page alert. A currency pair, a date, an open / close price, a stop loss and a take profit levels and traders comments are included with the message. As a visual help, all Sell alerts are provided with an orange text and with an orange background, all Buy alerts are in a blue text and with a blue background and all Closing signals are both grey for text and background. The Signalator alerts are sent with the "Signalator signal update" title and are sent from alerts at signalator mailbox. If you can't find the expected email, please check the spam / junk and the email registered with the website. Please note: Signalator cannot guarantee the delivery of neither SMS or Email to your accounts. We can guarantee, we will send alerts from our server in time and to all chosen delivery options. Q. How can I check my trading signals? A. To check your signals, you have to be registered (if you are not, click here to register). Enter your login and password at the top of any page and you will be redirected to your personal page where you can check all the subscribed signals. Q. Which delivery options are available? A. The signals can be sent via Email, SMS, automated trading and the personal page. All options are free with any paid subscription. Q. How to activate SMS / Email alerts? A. If you are a paid customer, then you may activate both the SMS and the Email alerts by yourself on your personal page. Use the article from our Help section - "How to activate Email / SMS alerts"? Q. I'm not receiving SMS or Email alerts I'm subscribed to. What do I do? A. If you are eligible for receiving either SMS or Email alerts and you still don't receive it, check the spam / junk box of your email box, the registered email for the receipt of Email alerts. If you are not receiving SMS, check the phone number (it must include the country code). Contact your personal manager to get everything working. Q. Are there any limitations for Email / SMS alerts? A. There are no any limitations for Email alerts to be sent. We send SMS to most countries and mobile operators. If you believe you may face any difficulties receiving SMS, contact your manager for a demo SMS.